Max. Height above ground: 239ft. 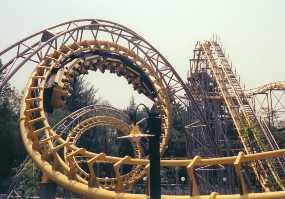 Special track elements: Banked Curves, Vertical Loop, Steep Twist, Half Loop, Corkscrew, Banked Helix, On-Ride Photo. Other info: Can give a slightly rough ride, but allows the most complex track elements to be used, and can be built to a large height. Maximum Ride Capacity: 72 guests, Vehicle Capacity: 4 passengers per car. Maximum Ride Capacity: 108 guests, Vehicle Capacity: 6 passengers per car.